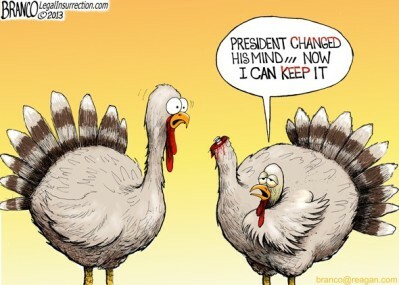 Presidential 'Hunger Games' Selects This Year's Turkey Survivors! 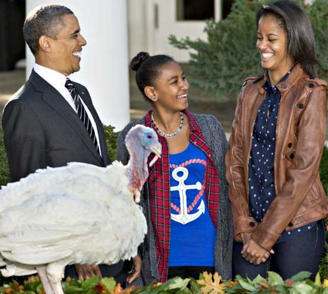 A lucky turkey by the name of Popcorn secured a pardon from the Leader of the Free World the day before Thanksgiving. The holiday ritual is America's way of honoring a long-standing tradition in a very symbolic way. In the 66th annual presentation of the National Thanksgiving Turkey, courtesy of the National Turkey Federation, the White House drew an analogy to the current box office hit, "Hunger Games." Obama joked about his traditional responsibility: "The office of the presidency — the most powerful position in the world — brings with it many awesome and solemn responsibilities," he said during a ceremony on the North Portico. "This is not one of them." Noting that Popcorn was one of 80 birds that competed for a pardon from the Thanksgiving table, Obama said: "It was, quite literally, the Hunger Games." As daughters Malia and Sasha and official guests looked on, Obama asserted his presidential authority: "Popcorn, you have a full reprieve from cranberry sauce and stuffing. We wish you well." As for runner-up Caramel — who is also being spared the axe this Thanksgiving as well— Obama considered this bird more of a political type of animal when he noted that: "he's already busy raising money for his next campaign." In the 1700s and 1800s, many presidents ate the turkeys presented to them. it appears our current day practice of saving or reprieving a turkey may have started with our 16th President, when Abraham Lincoln was said to have saved the life of a dinner-bound fowl that his son had taken a shine to. Flash-forward some 200 years, and voters throughout the country this year got to help the president out by casting ballots via Facebook, Twitter and Instagram. 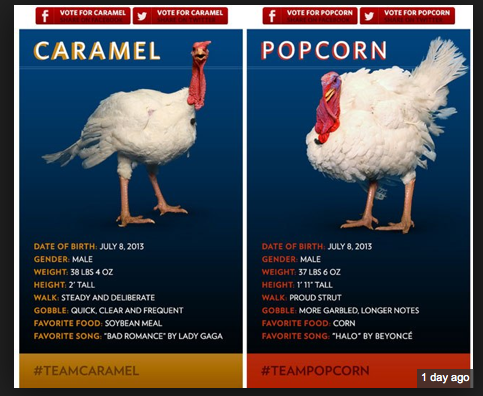 You can note from their descriptions that while the two top contenders were both born on the same day, Popcorn's "gobble" held longer notes and perhaps swayed the final decision in his favor because of his favorite song choice: Beyonce's "Halo" versus Lady Gaga's "Bad Romance." Caramel and Popcorn, both of whom are 20 weeks old and weigh about 38 pounds each, grew up on a farm in Minnesota. After the ceremony, the spared pair were chauffeured in a minivan to George Washington's Mount Vernon Estate and Gardens for public viewing during the holidays. After their pardon, the turkeys will live out their days at Morven Park in Leesburg, Virginia. Luckily for Popcorn and Caramel, there was no second-guessing by President Obama -- as the first cut is always the hardest! Need An Office Assistant? The Animal Video Of The Day!! !